Andy Davison, one of the Gippsland Cup organisers. 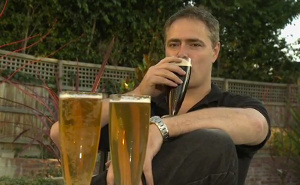 The Melbourne Brewers Club and Grand Ridge Brewery will hold the second Gippsland Cup homebrew beer competition early in February 2012. Any kind of beer from a Gippsland amateur brewer can be entered into the competition for free. The Cup will be judged by a panel which includes certified judges and prizes will be awarded for the top three local beers. The 2012 Gippsland Cup and Victorian Beerfest Competition will be held at Grand Ridge Brewery in Mirboo North on February 11. For more information, email info@melbournebrewers.org. A Melbourne Brewers Club spokesperson told The Warragul Citizen in an email today the group has high hopes for the competition. “The Gippsland Cup is in its early stages, so the intake of beers we are getting is much smaller, but we are really hoping to grow this comp and get some local brewers involved in putting their beers forward,” the spokesperson said.